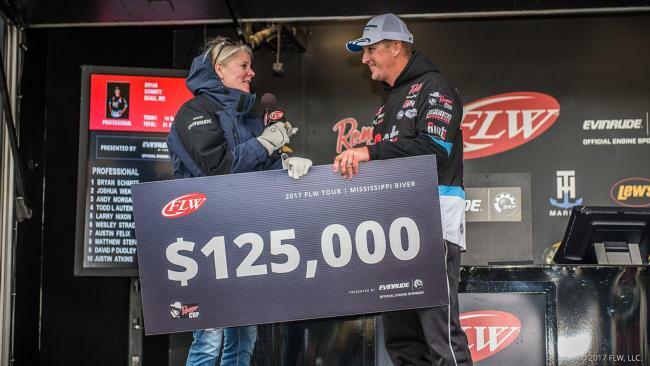 IBASSIN: Bryan Schmitt Wins 2017 Walmart FLW Mississippi River with 61-6lbs! Bryan Schmitt Wins 2017 Walmart FLW Mississippi River with 61-6lbs! No one really knew what to expect when the FLW Tour pulled into to La Crosse, Wisconsin. Plenty of tournament history exists on Pools 7, 8 and 9 of the Mighty Mississippi, but most of it is after June when the spawn is an afterthought and summertime fishing is in full play. Many Tour pros had never even been to this part of the Mississippi before, especially in May. Add to that high water conditions, uncertainty about the river’s grass habitat and - of course - the arrival of a nasty cold front during competition, and the Mississippi River essentially became a brand-new venue for most of the field. When it was all over, though, Deale, Md. pro and Potomac River wizard Bryan Schmitt channeled his river experience into an impressive 61-pound, 6-ounce four-day total to win the FLW Tour presented by Evinrude on the Mississippi River. Schmitt beat back a challenge from talented Tour rookie Josh Weaver, who finished second with 58-11, and three-time Angler of the Year Andy Morgan, to take his first FLW tour victory, $125,400, and a huge amount of momentum going into next month’s season finale on Schmitt’s home water. During the warm, balmy practice period, pros found plenty of largemouth and smallmouth on beds. At first, the event was shaping up to a bed-fishing beat down. But then, a deluge came on the day off, pouring more water into an already overflowing river. The pools filled with cold, muddy water and the competition rounds became a whole new game. Marked spawning beds played a role the first two competition days for early leaders, but by day three, spawning fish began to dwindle and nothing was coming in to replace them on beds due to rising water and dropping water temperatures. Instead of relying on spawners, someone needed to find a new crop of staging fish waiting for the next warm-up. As it turns out, the Mississippi River became an exact replica of the way Potomac River bass relate to large, grassy spawning bays, and Schmitt had all the keys to the castle. Someone might as well have dropped him into Chicamuxen Creek in April. One of the first places Schmitt sampled on day one of practice was the area where he ended up winning the event. The spot featured a huge U-shaped riprap bulkhead planted by river authorities to block current and slow erosion. Behind the bulkhead, lush vegetation had grown, making prime spawning grounds right off the river. Schmitt was initially drawn to the area due to the number of bass that were spawning there during practice. He returned to the area as his first stop of the tournament to find higher, muddier water pouring through the spawning area. Specifically, what Schmitt had observed was a patch of deeper, scattered grass that was clumpier in nature – not as matted as where the spawning fish were located. It was the kind of grass that prespawn and postspawn bass use on the Potomac before and after committing to beds in the matted stuff. For the next three days, Schmitt dialed in what became the winning pattern: bumping a swim jig into grass clumps where prespawn bass were holding, awaiting the next warm up for spawning activity. 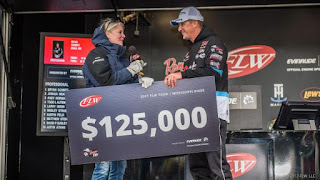 Schmitt’s lure of choice was the same one he uses to win so much money on the Potomac: a 3/8-ounce swim jig (black/blue) with a swimming trailer fished on 15-pound test P-Line fluorocarbon on a 7-foot Fitzgerald Stunner HD rod and an Ardent Apex Grand 7.3:1 reel. He would cast the swim jig out, hold his rod tip down and reel the jig steadily until it hit a clump of grass. Then he would twitch the rod two or three times to make the jig snap out of the grass for a reaction bite. On day one, Schmitt brought in 14-12. Once he got dialed in, his weights went up as he hauled in 16-4 and 15-12 the next two days. On the final day, Schmitt sealed the deal with a limit weighing 14-10, which put him in victory lane.